Never did I imagine that Washington DC would be such a fantastic cultural epicentre. Yes, it is the capital of The United States of America and of course it just happens to be the backdrop to one of my favourite Netflix series’ “House of Cards”. Indeed I knew this was a beautiful and mysterious city but never did I envision just how much there would be to see and do there and how very beautiful, green and sunny the city would be. I think I got lucky on the sunny part but it really was excellent weather everyday. The many sights, museums and galleries are incredible but in this post I am going to focus on my top five favourite places that I enjoyed visiting whilst I was there. You cannot visit Washington DC without climbing the famous steps and viewing the impressive Lincoln Memorial. The Lincoln Memorial is a structure that echoes a classic Greek temple, featuring stunning Yule marble from Colorado. The statue itself is a gigantic 5.8metre / 16 ft and pays a great tribute to the lawyer and 16th President of America, Abraham Lincoln, who led his country through it’s Civil War and in doing so preserved the Union. Inside the memorial inscribed on the walls are two well-known speeches by Lincoln. This site itself has been used for a multitude of famous speeches including Martin Luther King Jr’s “I Have a Dream” which is marked on the floor for all to be reminded. It is a moving experience to stand where he stood and imagine the crowds in front of you that day on 28th August 1963. 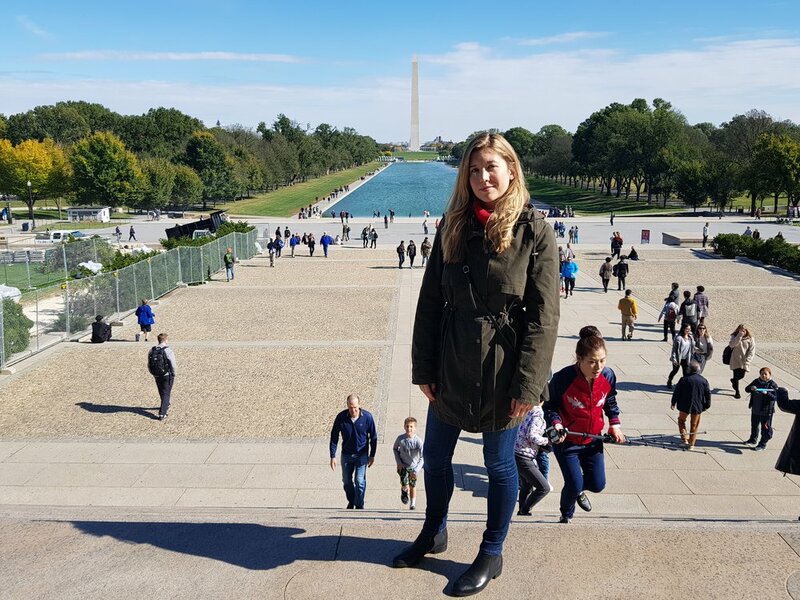 In addition, The Lincoln Memorial is the perfect viewing platform to look towards the reflecting pool, Washington Monument and Capital Hill as it’s backdrop. 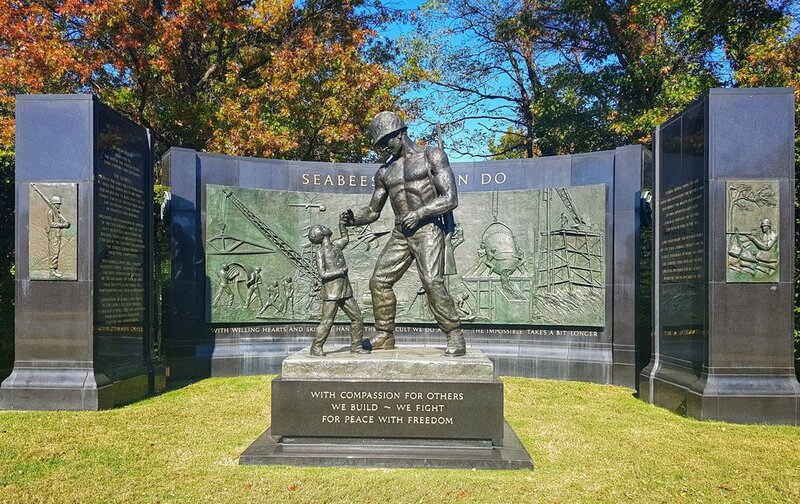 Also in very close proximity are memorials which you can easily walk to incuding; Korean War Veterans Memorial, National World War II Memorial and the Vietnam Veterans Memorial. All powerful memorials in their own right and very much worth paying visits to. I actually visited this museum twice as the first time round, I ran out of time. The main attractions for me here were ‘The First Ladies’ exhibition, featuring a collection of two dozen luxurious gowns worn by First Ladies. Two notable dresses for me were Hilary Clinton’s, which was an exquisite purple gown and a unique floor length dress in cream worn by Melania Trump, both dresses were worn at their husband’s inaugurations. I also enjoyed learning all about the American President’s throughout the ages and the importance and influence from their wive’s in their roles as First Ladies. Another favourite exhibition was ‘America on the Move’ which takes you on a captivating journey from the introduction of a railroad in California in 1876 through to the role of the streetcar and automobile, both forever changing daily life for the nation and connecting the country in ways that no one thought imaginable. There is a fantastic steam train featured in the exhibition which was very impressive as well as 339 other historic artefacts and modes of transport on display. Walking into this vast museum, the entrance is impressive but even more striking is the gigantic African Bush elephant that greets visitors. This elephant was installed in 1959 and has become an icon in it’s own right and has a weight of 12 tonnes and is a staggering 14 feet tall. Believed to have originated in India, the Hope Diamond features in the museum and is one of the most famous diamonds in the world. As someone who enjoys gem stones, especially those that excessively sparkle, it was a treat to see this up close, well, as close as you can get through a cabinet of very thick glass, perhaps not surprising when this stone's estimated worth is between $200-$250 million USD. It’s much admired rare blue colour is due to trace amounts of boron atoms and it weighs 45.52 carats. 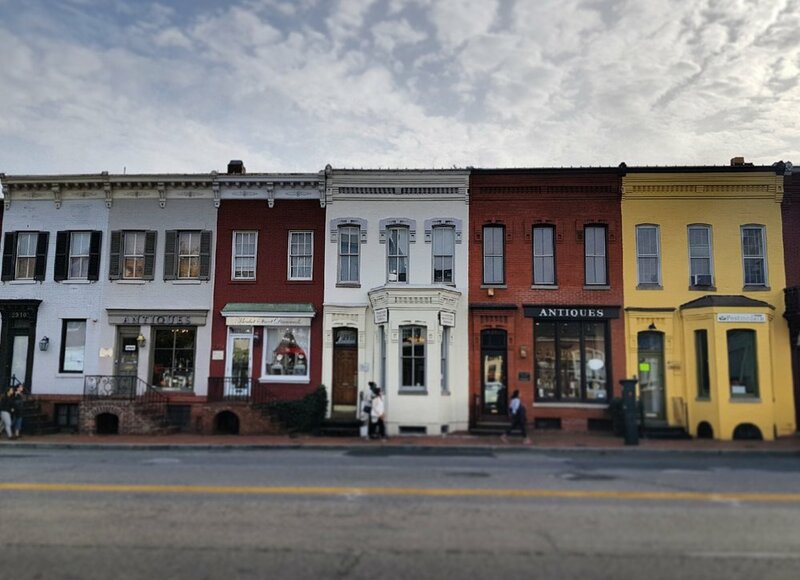 I cannot express enough how much I enjoyed exploring the historic Georgetown, first founded in 1751. A gorgeous neighbourhood located in northwest Washington but close to the city and all the main tourist attractions. It is also home to the main campus of Georgetown University and the excellent Four Seasons Hotel, where I stayed. The best way to give some insight into what the town looks like are through my photos, as below. There is also fantastic shopping, little boutiques, antique shops and retailers from all over the world to suit all tastes and preferences, including J Crew, All Saints, Sephora, Lu Lu Lemon, Banana Republic and Urban Outfitters to name a few. If you are looking for retail therapy whilst on your trip then this is not a bad place to start. Two restaurants that we ate at in Georgetown were Old Glory serving lots of hearty BBQ food and Martin’s Tavern, where we had bellini's and a breakfast of traditional egg’s benedict, and I had the pancakes with bacon too. We sat in the very booth where John F Kennedy proposed to Jackie Kennedy Onassis which felt rather special, particularly as we were there with our good friend Chris on the morning of his wedding. I would highly recommend going down to Georgetown waterfront too where you can walk along towards the Lincoln Memorial and take in views of the state of Virgina across the water, as well as Arlington Cemetery. Arlington Cemetery is a peaceful place of remembrance. It is the final resting place for over 400,000 active duty service members. The 600 acres of grounds are beautifully landscaped and being there I felt a deep sense of sadness, yet serenity. It is very much worth a visit. John F Kennedy is buried there, you can visit his memorial, there is also Arlington House and Changing of the Guard at the Tomb of the Unknown Soldier. 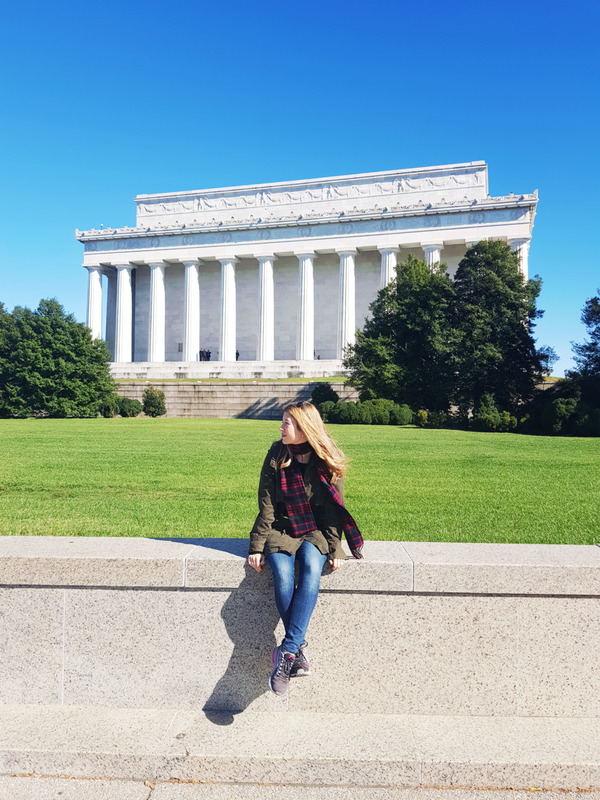 Overall, it was a brilliant trip to Washington DC, I cannot recommend this city enough, it really surpassed all expectations. There is so much art, monuments and history to learn about and see. I also wanted to add that I visited the Renwick Gallery which was great, some images I have posted from there on my instagram, it is an interesting craft and design museum where we were given an excellent guided tour. The best way to see the city depends on where you are staying, we did one bus tour with Big Bus City Tours for a general overview and to get additional information on sights but for every other day we walked and took the occasional uber taxi. It really is an easy city to navigate and Autumn was a fantastic time to visit with cold crisp air yet wonderful sunshine everyday.